Cricket Australia tweets Final ball. Five to win. Four for a Super Over. Spot in the Final up for grabs… Then this happens! Haidee Birkett, take a bow! It’s the stuff of epic cricketing theatre: a six required to win off the last ball in a do-or-die semi-final. That was the task Sydney Thunder’s Nicola Carey was staring down, with her team needing five runs off the last ball against the Brisbane Heat to progress to the Women’s Big Bash final. Only a maximum would do. Heat tweaker Jess Jonassen flighted in a ball down the leg side. Carey had sized it up. Adjusting her body, she hammered the ball aerially over square leg. It was headed for the fence, but travelling at a low trajectory. Steaming in from fine leg, Haidee Birkett was making serious ground. To the gasps of the crowd, and elation for the Heat, Birkett took the catch superbly, applying the brakes in time and dropping to the floor to avoid overstepping the boundary rope. 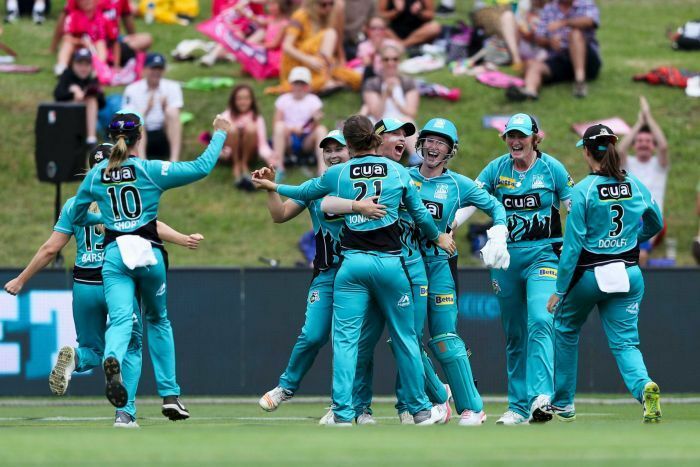 It sealed a thrilling four-run win for the Heat, which progressed to the WBBL final, at the cost of a deflated Carey and her Thunder teammates. Such was the epic nature of the win, even former Heat player Ashleigh Barty found time to congratulate her old franchise during the Australian Open tennis tournament. The Heat had set the Thunder 141 to win after Sammy-Jo Johnson (33) and Laura Harris (32 not out) led the way for the Brisbane side at Drummoyne Oval in Sydney, with six Thunder bowlers picking up a wicket apiece. After losing her partner early, Rachel Priest helped set up a strong response from the Thunder before she fell for 44, but apart from Alex Blackwell’s 29, there were no real strong contributions from the batters to follow. Carey looked like she would pull victory from the jaws of defeat with her 19 from 10 balls, only to be denied a Hollywood-style winning finish at the death by the fleet-footed Birkett. The Heat may have sat back to watch the second semi-final thinking they had produced the moment of the day, but they were trumped by the Sydney Sixers and Melbourne Renegades who delivered an even more unlikely finish. The Sixers struggled with the bat in their 20 overs, and set the Renegades a target of just 131 to win. With an over left, the Renegades needed 13 for victory and 12 to force a super over. The Melbourne team’s ace was Sophie Molineux, who hit a four off the first ball from Sixers’ star Ellyse Perry. A couple of singles made the equation seven needed off four balls, then Molineux hit consecutive twos to leave her team needing three to win off the final ball. What happened next was stunning. Molineux looked to have won the game as she hit the ball off towards the rope. The fielder at deep cover, Erin Burns, then ran round and flung herself at the ball to stop the four. Teammate Sarah Aley was on hand to fire the ball to the batter’s end, as Molineux and Claire Koski went for the winning run. Koski made her ground, but quick-thinking wicketkeeper Alyssa Healy whirled and fired the ball to the non-striker’s end, and her throw hit to run out Molineux and force a tie and a super over. Both teams were stunned, and it took a few minutes to confirm that there was no boundary, and a completed run out. The Renegades then went first in the super over, but top bowling by South African star Marizanne Kapp kept the team to just six runs. The Sixers scored four off the first four balls of their over, and then Perry stepped up to smash the ball from Mollie Strano over wide long-on for six to win the game. Perry had earlier carried her bat for the sixth time this season, scoring 54 off 59 balls opening for Sydney. The Sixers captain also took 1-20 off her four overs, took a catch to dismiss the Renegades’ Jess Cameron, and helped run out her opposing skipper in Amy Satterthwaite before hitting the winning runs. 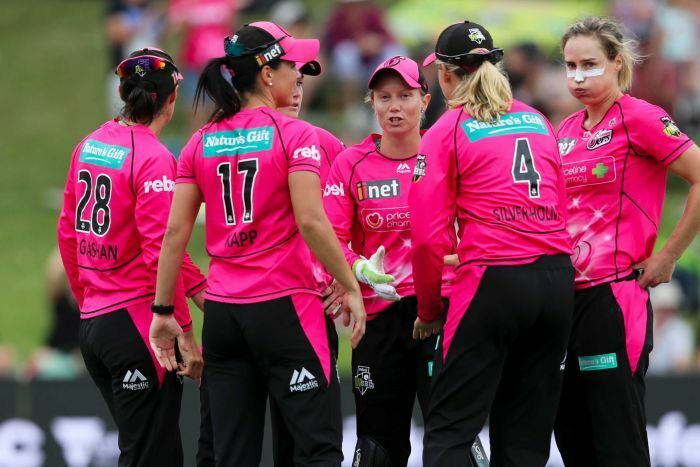 The Sixers will now face the Heat in the WBBL decider at Drummoyne Oval on Australia Day — they two final sides will have a job ahead of them to match today’s games for drama.